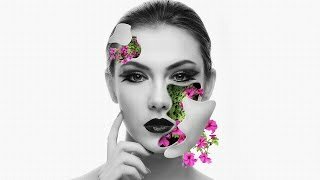 Photoshop Tutorial - Flower Face Effects. Как сделать в Фотошопе? So today we have some fun editing tricks by using photoshop, I hope you enjoying this video :) Let's get started!.. first, create a new Solid Color (black) layer.. Duplicate the Model and drag it on the top..
Let me rename the layer as Model.. Select the Pen tool (P). We start to make selection on the face parts, see how it works.. Right Click & hit Make Selection then OK. Select Marquee tool (M), right Click & copy it via Cut. Now, I will make another one using the same technique..
Then it will look like this :D.
Next, double Click on the Model & choose Bevel & Emboss. And refer to the following settings. Drag the Flowers and drop it onto main project using Move tool (V). I will drag it to the bottom of the model. Ctrl+T to resize it ..
Press enter or Ok when you done! duplicate the layer & drag it on the top of the model. Load the selection, press Ctrl & Click on the model layer. Then adding a layer mask Ctrl+I to invert ..
Use the Brush tool (B) with White, we will restore parts of the Flowers. Create a new layer on the top of the Flower, & use the Brush tool (B) with black..
And paint it as follows ..
* reduce the Opacity *. Ctrl+J to Duplicate layer & Ctrl+T to resize it. And do it like the previous technique. And it look like this :). * restore the hidden layer *. Oops.. I will reduce the Dept ..
Now, select the Model layer, & create a new adjustment layer - Hue/Saturation.. Clip to layer below, & bring down the Saturation all the way (-100). And increase the Lightness just a bit. Making Group of skin part layer. Create a new - Hue/Saturation, clip layer below. and do like the model layer. * let me fix this layer edges *. Last step, press Ctrl+Shift+Alt+E to merge visible I will add some textures to this project, see how it works :).